Considerable clouds this evening. Some decrease in clouds late. Low 37F. Winds light and variable.. Considerable clouds this evening. Some decrease in clouds late. Low 37F. Winds light and variable. The Anaconda stack is shown here in 1984. Look closely above, and you’ll see Omar Schultz scaling the massive stack. Schultz, who was in his 70s at the time, was the main safety inspector for the stack for 35 years. Today, only the stack remains at the Anaconda smelter site. ANACONDA - On Sept. 29, 1980, "Black Monday" hit Anaconda. Officials with Atlantic Richfield Co. announced the immediate suspension of operations at the smelter that had long propped Marcus Daly's once-booming town. The refinery in Great Falls would also close, combining to $40 million in lost annual wages and fringe benefits, according to a 1980 Associated Press report. Then-company President Jim Marvin said the decision was based on inability to economically meet state and federal environmental regulations. It came just three years after the Anaconda Copper Co. merged with ARCO. Between 1,000 and 1,200 smelter workers woke up without jobs. Several hundred more were laid off in the coming year. Total employment in Anaconda fell by 2,784 from 1970 to 1990, according to figures from the Regional Economic Information System by the U.S. Department of Commerce Bureau of Economic Analysis. Chuck Stokke, 62, and his wife, Wini, started their orthodontic practice in 1976, renting space off Commercial Avenue where the county public health offices are located today. negotiations and new construction projects. Nobody sensed any trouble at the smelter, much less its homegrown leader. "Quite frankly, he had no idea the closure was coming," Chuck Stokke said. "A lot of people weren't believers until they decided to just demolish the whole thing." In 1979, Stokke moved his practice to its current location at 116 W. 3rd Third. He needed more space to keep up with business. One year later, someone came into his office and broke news the smelter had closed. As he had before, Stokke talked with his father, who told him he thought the smelter would be shut down forever. "It was difficult for him, because he personally knew so many people there," he said. Mel Stokke died in 2005. Much of the population and workforce left town, but business at the Stokke practice actually increased. As part of workers' severance, ARCO had extended benefits for another nine months. Despite the uncertainty surrounding the town, Chuck Stokke never feared the worst. He had established a solid practice, and the families who did stay in Anaconda still needed a dentist. Some people who did leave have since returned out of love for the area and its recreation, Stokke said. But there are still obstacles to overcome, with Superfund stigma at the forefront. "It's a long process, and one that's still going on," he said. "We're still missing a lot of basic services and a diversity of well-paying jobs." Anaconda still needs a vital core of activists who can promote the area and future growth, Stokke said. "I see flashes of that from time to time," he said. "I know there are individuals working on that, but it needs to be more of a broad-based effort." Growing up in Somers, on Flathead Lake, during the Great Depression, Darcy DeLong, 83, learned to live by moderation. "The Depression taught you to live within your means, and don't expect anyone to give you a handout," DeLong said. DeLong began with the Anaconda Copper Co. in 1953 as a timekeeper on the smelter. He joined the company auditing department in 1957, making sure its properties in the West also stayed within their means. DeLong would leave his new home in Opportunity for up to six weeks at a time on business. He also did year-end audits at the Anaconda smelter and Butte, Anaconda & Pacific Railway. Those two employed a majority in the area, DeLong said. "It did hire a lot of people," he said. "As long as you didn't sue them, they'd give you a lifetime job or a college degree." DeLong and his family had settled in good financial shape when the smelter closed. He stayed with the auditing department until 1968, and by 1980 had retired and become a county commissioner. The decision to close the smelter did not surprise DeLong, he said, but it was tough to see so many people out of work. "Anaconda was modernized toward the end, but they'd made some mistakes," DeLong said. "I was always hopeful they could work something out with ARCO." DeLong scoffs at the notion that Anaconda almost shut down with the smelter. Yes, the county did lose population, but others remained to work at nearby Butte, Deer Lodge and Warm Springs. "This is a good county," DeLong said. "We may fight among ourselves, but we try to get together to work for everybody." Anaconda will remain a bedroom community until it is able to attract new industry, he said. "As far as the pollution, where can you go on this planet that doesn't have some kind of pollution?" he said. "I think this is a healthy place to live." Bill Montgomery, 80, made $18 per day when he started work at the smelter in 1948. That's more than four times the $4 per day his dad made starting at the foundry. "Most people that lived here either worked in town for someone, or up on the smelter," Montgomery said. "Anything you wanted to work on up there, you could do." Born and raised in Anaconda, Montgomery joined the smelter after graduating from Anaconda High School. He spent a year with the Air Force, but came right back to work. Montgomery began as a general laborer before moving up to ironworking. Cutbacks forced the smelter to lay off Montgomery a first time, but he soon rejoined the team as an electrician. He became an electrician foreman in 1968. As the smelter grew, they kept busy putting up new 40-foot electrical poles to keep the juice flowing. That growth ended abruptly in 1980, Montgomery said. "I never thought it would close down. There was talk of building more before that happened," he said. Montgomery stayed two more years at the smelter, helping complete the shutdown. He was laid off again in 1982, this time with no other positions available and three kids still in school. "You figured they might go back to work, but they never did," he said. The electrician who watched the smelter grow stayed in Anaconda, joining another mining company that helped tear it down. "You're bound to have memories," he said. "You don't like to see it, but was interesting in some ways." A back injury on that job forced Montgomery to retire in 1990. Montgomery is not sure if the town will ever completely rebound, he said, though people learned how to live without the smelter. "It looked tough there for a while," he said. "When you get shut down, you lose just about everything." In his garage, Lorry Thomas, 83, hangs a collection of railroad lanterns collected through his years with the Butte, Anaconda & Pacific Railway. 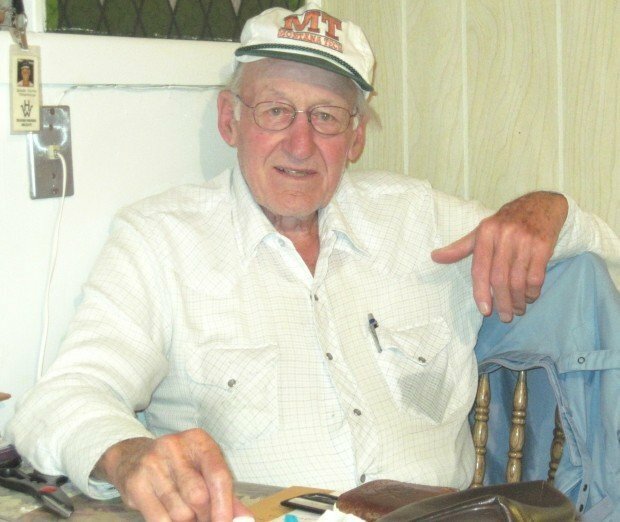 Thomas began at the BA&P in 1952, when trains hauled ore from Butte mines to the Smelter City. He spent 30 years with the BA&P, 15 as a fireman on the engines and 15 as a carpenter. The railroad worked strictly on seniority, Thomas said. "If you had a guy one day ahead of you, he was smarter because he had seniority," he said, with a smile. Everybody was stunned when the Anaconda Co. shut down operations, Thomas said. About 40 guys lost their jobs in engine service alone, not counting the switchmen, electricians, machinists and others. "Guys just couldn't believe it," he said. "They worried about how they would support their families." With his skills in carpentry, Thomas was one of the guys who stayed in Anaconda and "toughed it out." He never considered leaving, especially with the all of the area's outdoor recreation. Thomas remains the president of the Anaconda Sportsman Club, a position he's held "for a long time," he said. "The hunting, fishing and hiking ... that's why we're here," he said. Superfund will be tough for Anaconda to overcome, Thomas said, but he is pleased with some of the cleaning efforts. "Things here have settled down," he said. "It's the best place in the world to live." Reporter George Plaven may be reached via e-mail at george.plaven@lee.net. In the morning of Sept. 29, 1980, 25-year-old Jim Davison went to work at the downtown Anaconda offices of Atlantic Richfield Corp.